St John`s Book of Remembrance commemorates the parishioners of Canberra who served, died or were killed in World War Two. The book is in a shrine inside the south wall with a metal grill covering the alcove. The Shrine and the plaque above it were the gift of Lady Brudenell White in memory of her husband General Sir Brudenell White who was killed in the Canberra air disaster of 1940. The Shrine of Remembrance at St. John's Parish Church will be unveiled and dedicated on Sunday afternoon, April 24. 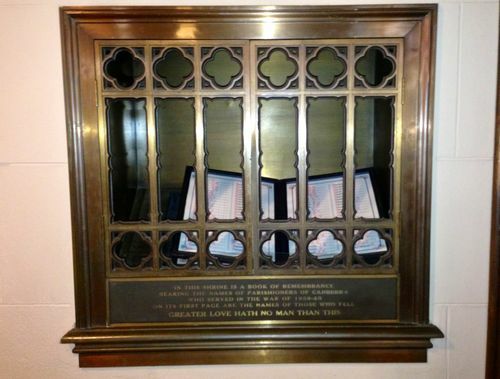 The bronze shrine, set in the south wall of the church, will contain a Book of Remembrance bearing the names of Canberra parishioners who served in World War II. On its first pages are the names of those who died. The shrine and a plaque above are the gift of Lady Brudenell White as a memorial to her husband, General Sir Brudenell White. The book, which is a work of fine artistry, is being provided by Canberra parishioners. It is hoped Lady White will unveil the memorial, which will be dedicated by the Bishop of Canberra and Goulburn, Rt. Rev. Dr. E. H. Burgmann. The address will be given by Dr. C. E. W. Bean, War Historian, Chairman of the Board of Management of the Australian War Memorial and a former friend of Sir Brudenell White. The Canberra Times, 23rd March 1955.